Any time you undertake a remodeling project, you are going to have some amount of waste. 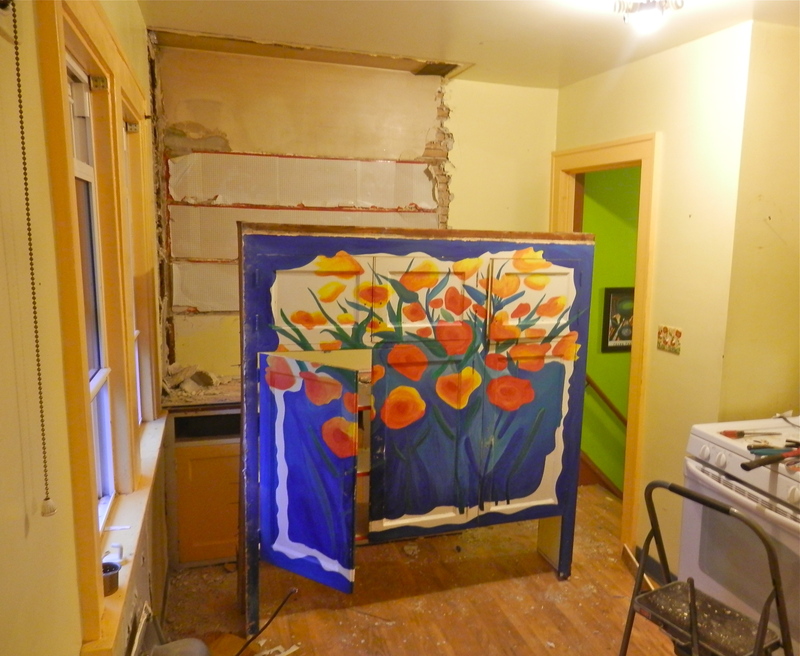 We were completely gutting the kitchen so we would be producing quite a lot of it. You can make mindful decisions about it – or you can rent a dumpster and just let chips fall where they may. We tried to be mindful and we used the phrase “reduce, reuse, recycle” to guide decision making. Keeping the Footprint Small: One of the first decisions we made was to stay within the confines of the existing house. An addition would have used a lot more materials and produced a lot more waste. Instead we incorporated a back landing into the kitchen and then focused on efficient use of the small space. Understanding – and Minimizing – Storage Needs: Before we took down any cabinets, we took everything out of the kitchen and sorted it into categories of what we used every day, what was used seldom and what we would give away. Less stuff means less storage space. Pulling the Plug? We’ve purged small appliance before but this was a good opportunity to take another look. Was there a non-electric option? Did this item fulfill a unique function or would the stove work just as well? We kept the blender, the hand mixer, the coffee grinder, the juicer, the bread maker, the slow cooker, the rice cooker/steamer, the toaster and microwave toaster oven. We use these every week. The new stove has some cool features like slow cooking and bread proofing so once we get used to all of its functionality, we’ll see about shifting away from some of those separate appliances. Reusing elements of the old kitchen would have kept costs down but would not have met our goals. The gas stove went to a son with a new house. A beautifully painted floor-to-ceiling cabinet was carefully removed and donated to Junket: Tossed and Found, an upcycling shop in the neighborhood. Unused kitchenware was given or donated. Salvaged cabinets were set out by the sidewalk and taken. We tried to salvage the floor but the vinyl didn’t cover the new area and the old floor was too badly damaged. God knows, we tried for weeks to save it before giving up. We kept only the kitchen faucet and the scary old doorbell. The rest of the garbage – plaster and lathe, hardwood floor boards covered in staples, nails, glue and vinyl, 100-year-old cabinets that couldn’t be wrestled out of place without breaking apart – were taken away by a hauler who sells to the garbage incinerator that produces electricity for our city. In a sense, it was reused. I don’t know the cost benefit analysis of incineration vs landfill. According to this MPR story about the HERC incinerator, Minnesota has a waste heirarchy. Reduce-reuse-recycle is at the top of the heirarchy, waste-to-energy is next, and land filling is at the bottom. Nothing went to the landfill so I guess we did as good as we could. Recycling was the answer for the refrigerator with a dying compressor. The company that sold us the new fridge recycled the old one. Next post – thinking about our energy future and how electricity will be used in our kitchen. This entry was posted in Reduce/reuse/recycle and tagged garbage incinerator, kitchen remodel, recycle. Bookmark the permalink.